The Merrie Greenwood Players are looking for new members for the Renaissance Faire. Auditions at 9 a.m. April 5. Information: E-mail eaglcrst@gte.net. The Cleveland Shakespeare Festival, celebrating its 10th year, will present King Richard III on Saturday, August 4, and The Taming of the Shrew on Sunday, August 5, at Cuyahoga Community College’s Western Campus, 11000 Pleasant Valley Road, Parma. Both performances are free and will begin at 7 p.m. in the Outdoor Amphitheatre. King Richard III, directed by Allan Byrne, is a history play in which the evil Duke of Gloucester becomes King Richard III through a devious and violent plan. The comedy, The Taming of the Shrew, directed by Cleveland Shakespeare Festival Artistic Director Larry Nehring, features the courting of Bianca, whose father will not allow her to marry until her nagging, fault-finding sister Katharina is pledged to be wed.
Bring your lawn chairs, blankets and snacks. In case of inclement weather, the performance will be held indoors. For more information, call the Western Campus Theatre Box Office at (216) 987-5536. So what would have made it onto a medieval bestsellers’ list? The Bible and parts of the Bible, such as Psalters, as well as prayer books and religious poetry, consistently topped the charts. History was popular, too: the stories about Roman emperors collected by Valerius Maximus still survive in around 400 copies. Geoffrey Monmouth’s history of the kings of Britain can be found in 200 remaining copies. Discarded or outdated editions of books were put to good use. They were made into binding materials for new books, or, after Henry VIII dissolved the monasteries in the 16th century, into kites or covers for jars. Urban literacy is just one of the topics being covered at this year’s IMC, which has as its focus medieval cities in Europe and neighbouring territories to coincide with the 800th anniversary of the foundation of the borough of Leeds. Chris Schultz of South Yarmouth is a pirate king, and being a pirate king means he works alongside acrobats, puppeteers, acrobats, jousting knights and an 800-pound half-lion, half-tiger all day. But that’s not what keeps him coming back as a performer at King Richard’s Renaissance Faire in Carver. At a cast audition earlier this month for the Faire’s upcoming season, Schultz revealed, in true pirate-king style, his real reason for performing there year after year: the constant presence of barely covered bosoms. ‘‘It’s a pure love of cleavage and corsets,’’ he joked. Schultz, a fair performer for five seasons, then said in a more serious tone that it’s the camaraderie of the cast that makes him want to join for a sixth season. ‘‘Whenever you do a show, the cast gets really close,’’ he said. Jasmine Ready, also of South Yarmouth, who was auditioning to be a singer, actor cast member. Jasmine was among 20 others who tried out to entertain crowds at the Faire, a 26-year-old South Shore tradition. It helps to know - and like - each other when you’re doing ad-lib street theater that visitors seem to love, said Allison Martell of Groton, who played a pirate wench last year. When things at the Faire go as planned, on-the-spot Renaissance acting looks like second nature to the visitors. But the cast members go through a great deal of training and preparation. It starts with an audition for an apprenticeship, a free theater program that runs on the weekends in August, said Bonnie Shapiro, the Faire’s producer and creator. This is where they learn proper customs, manners, dialects - and sword fighting. ‘‘We give them a character and help them develop that character,’’ Shapiro said. The apprentices are graduated as full cast members and can perform in September, Shapiro said. All of the performers vying for a spot at auditions two weekends ago were either past cast members or veteran singers and actors. The auditions were for the Faire’s featured scenario play, which director Dan Gately describes as a snarky, Broadway-style musical set in the 16th century. The Pennsylvania Renaissance Faire is seeking performers and stage crewmembers for its 27th annual season. Auditions are set for 9 a.m. to 6 p.m. Saturday, Feb. 17, and Sunday, Feb. 18, in the Mansion at Mount Hope Estate & Winery in northern Lancaster County, Pa. Cast members portray 16th-century Elizabethan characters performing Shakespeare and interactive improvised scenarios and stunt and stage combat sequences along the village streets. Renaissance-styled or period stage acts or musical groups should submit any promotional materials, DVDs, videos or CDs of their work and be prepared to perform 3 to 5 minutes. Schedule an audition time by calling 717-665-7021, ext. 231, from 9 a.m. to 4 p.m. Monday through Friday. Additional information may be found at www.PaRenFaire.com. My Lords and Ladies, join us as we recreate the Age of Chivalry and Charlatans at the 3rd Annual Fishers Renaissance Faire. Queen Elizabeth invites you to attend a Volunteer and Entertainer/Cast Information and Orientation session to learn more about the history and language of the Renaissance; how the faire celebrates Fishers’ ancient sister-city, Billericay, England; and how you can bring your talent and enthusiasm to the many volunteer opportunities available. No auditions are necessary for general volunteers and cast members, but auditions will be held for those interested in performing as actors, minstrels, jugglers, tumblers, magicians and entertainers of every sort from the era of Glorianna. Entertainer/cast volunteers: please be prepared to do a short 2-5 minute audition so that we can properly place you. NO previous experience with renaissance faires is needed. Here is your chance to get involved with the community and help put on a family friendly event. There are also non-costumed volunteer positions available. Sunday, Feb 11 2:00 p.m. – 5:00 p.m. The Virginia Renaissance Faire is holding auditions for a large cast of students, hobbyists, educators, professionals, and crew volunteers to bring the little town of Staffordshire, England to life. 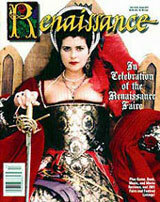 The 2007 Virginia Renaissance Faire is held at Lake Anna Winery on Saturdays, Sundays, and Memorial Monday from May 19th - June 17th. Rehearsals are held various weekends from March through May. The faire is holding auditions for musicians, crafters, military, nobles and a variety of other street characters who become the inhabitants of Staffordshire. The Fanfare Brass has openings for brass players and drummers and the Blue Run Jousters are in need of horse-loving squires. No prior theatrical experience required. Security, first aid and building and grounds crew (non-costumed) are also needed. Crew shirts and caps are provided. …It is perpetually the night before Christmas at the Great Dickens Christmas Fair in San Francisco. The part-theater, part-crafts festival runs each weekend, spreading holiday cheer from now until nearly the real night before Christmas. The Dickens Fair is the place where the people who love the Renaissance Pleasure Faire go when it is wintertime. But instead of jesters and wenches munching on turkey legs, there are chimney sweeps and fair ladies in cinched corsets sipping mulled wine. It is a place where you can breathe in the sweet smell of roasted almonds with cinnamon and bump into old Ebenezer Scrooge, who will refuse to let you move on without a hassle about work. It is also a place to get crafts for the home. More than 150 crafts people line the streets of the 100,000-square-foot space. And if you ever wanted to know how to decorate a bare space — as the exhibition halls are during non-Dickens Fair times — take a moment to appreciate the surroundings, which are modeled after Christmas time in 19th century London. creates such a theatrical environment," says Kevin Patterson of the Patterson family, which has produced theDickens Fair for more than 30 years. The Patterson family also produces the Renaissance Faires at Black Point and Stafford Lake in Marin County. "It's really like jumping into the pages of a book." Patterson spent the morning of opening day browsing the shops himself. He says the earlier people go to the event, the better the selection of crafts for the home. The saying goes at events like the Dickens Fair that there is something for everyone here. Kids will like the throwing games that always come with a prize, no matter how good you are. Adults will like the sea chanties being sung by a brood of men on a wooden stage near a small shipwreck. They will also likely open their wallets to buy some of the items for sale at the event such as homemade knives, wooden boxes and Christmas decorations galore. "This is the first time we've come," says Maggie Oman-Shannon of San Francisco, "and I feel we got our money's worth right at the door..."
"I want to be a princess," Colleen Standly tells shopkeeper and artist Rosie Echelmeier as she decides on a headdress that is just right for her. Daughter Julia Standly nods in approval as her mom whips out a fresh $100 bill to pay for the sparkling piece. "The crafts here are fabulous," Standly says pointing to other items the twosome purchased at the event, which include pirate socks and a jester cap. The staff of the Renaissance Faires Weblog will be on vacation for the next two weeks. Please come back and visit us to read new posts after October 2nd.
. . . The 25th annual Charity Renaissance Faire takes place Saturday and Sunday in Pine Park. Renaissance fairs have become pretty elaborate affairs in recent years. Attractions have included archery contests, living chess tournaments, jousting knights and even full-scale choreographed sieges of the king's castle . . . So verily I say to you, dear reader, this weekend's event is co-sponsored by the Lakewood Lions Club and the quaintly named Society for Creative Anachronism. The Faire will take place rain or shine, from 10 a.m. to 6 p.m. Saturday Sept. 16th and 10 a.m. to 5 p.m. Sunday Sept. 17th. For more information go to www.lakewoodrenfair.com. To read the complete article, please go here.